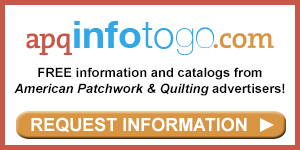 See the featured quilts and web-exclusive color options and projects from the American Patchwork & Quilting June 2019 issue. 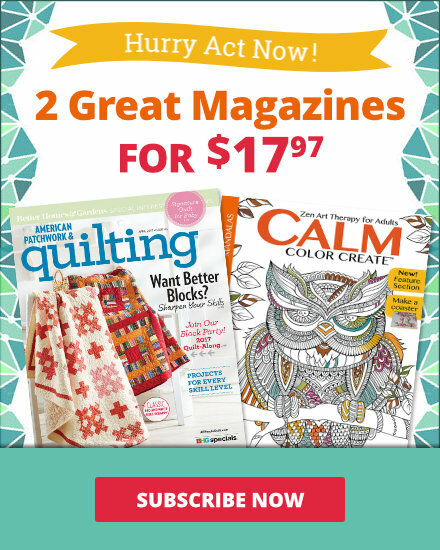 The June 2019 issue of American Patchwork & Quilting is on sale from April 5-June 6. 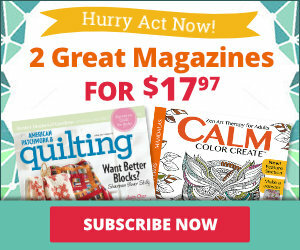 Subscribe to American Patchwork & Quilting here. Make an oversize pincushion that will become your newest sewing essential. Use scraps to create a Singer Featherweight sewing machine on an oversize pincushion. Let a Nine-Patch block represent a quilt ready to be sewn. Piece a rainbow of same-size strips to create a Rail-Fence quilt inspired by the color wheel. Be prepared to welcome autumn with a four-block table topper in warm hues. Quilt tester Monique Jacobs used the same dark orange print for the center of each block to give the eye a place to rest. Pinwheel blocks appear to rotate to give a bed-size quilt energy and movement. Fabrics: Wit & Wisdom collection by Kim Diehl for Henry Glass & Co.
To create a wall hanging using Fresh Spin blocks, managing editor Janet Klockenga chose Civil War reproduction prints in reds, greens, and golds. Concentric rings of small squares distinguish the timeless Trip Around the World block. To update the look of a Trip Around the World block, quilt tester Martha Gamm used bold floral prints for the squares and fussy-cut the center square. Kick off summer with a picnic on a classic quilt. Quilt tester Colleen Tauke’s choice of warm colors transformed the mood of Positively Patriotic. Kimberly Sandberg of Handi Quilter machine-quilted a fluid design that adds a sense of motion to the wall hanging. Kettle’s on! A wall hanging of teacups made out of vintage-style fabrics features 12 different blocks. Piece two mug rugs for the next time a friend comes over for coffee. A longtime friendship between quilters brings about a scrappy tribute. Batiks create a light and airy feel in this table topper by quilt tester Sharon McConnell. Because Sharon used beige batiks that are similar in contrast for the background, the stars appear to float in the open space. Piecing with strip sets controls the scrappiness of a full-size quilt composed in an airy coral, green, and aqua palette. Quilt tester Diane Tomlinson featured poppies, the symbol of remembrance, in a charming table topper that is just right for summer picnics. To showcase the flowers, she fussy-cut the smallest poppy print for the corners of the Nine-Patch units. Strip-set blocks in bright modern prints. Subtle florals in simple strip-set blocks compose a springtime table runner. 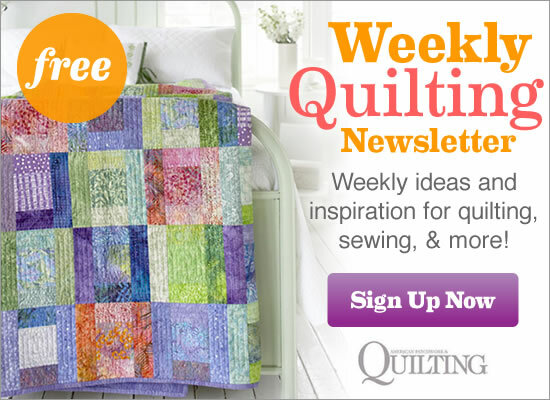 Choose a fresh color palette to give a vintage quilt design a modern vibe. To order this kit, contact vfwquilts.com or 718/877-6710. 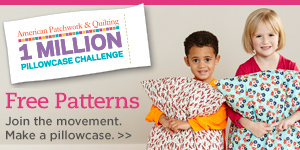 Managing editor Janet Klockenga showcased bold, modern prints and an eye-popping solid yellow in the crib quilt.